In April, the Consumer Financial Protection Bureau (CFPB), the federal agency charged with reining in the abusive financial practices, released a white paper that examines payday lending. 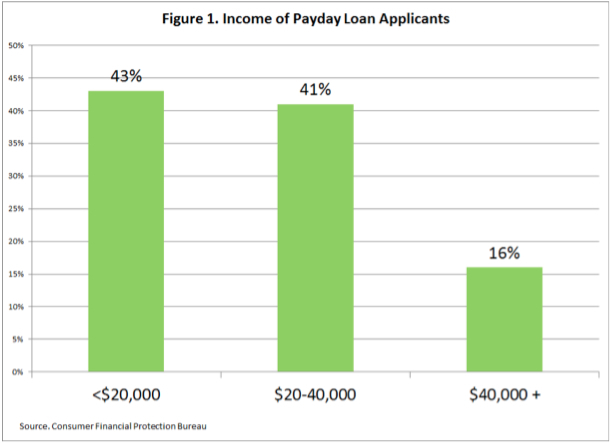 Based on data collected from payday lenders in 33 states, the paper provides a very basic picture of the key characteristics of the people using these products. As Figure 1 below illustrates, the CFPB found that the overwhelming majority (84%) of borrowers have incomes of less than $40,000. 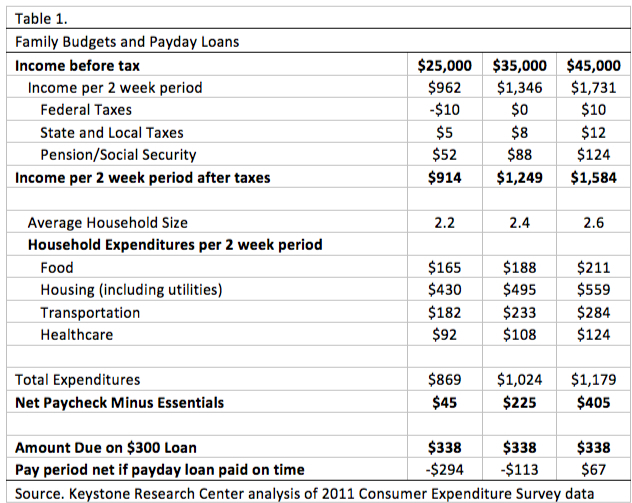 With incomes this low, the typical customer actually falls farther behind in their bills after using a payday loan — a point we argued last year using data from the Bureau of Labor Statistics’ Consumer Expenditures Survey (CES). Table 1 shows conservative two-week spending patterns for an average household making $25,000, $35,000, or $45,000 per year. These three family budgets are based on surveys of actual family spending patterns (drawn from the CES) and include expenses such as food, housing, utilities, transportation, and basic health care. They do not include additional costs such as child care, clothing, and previous debts, including credit cards or car loans. A borrower who takes out a $300 payday loan in one two-week period must repay the $300 in principal plus $38.22 in interest and fees during that same period. Based on the CES, families earning $25,000 or $35,000 would be unable to make up the cost of the payday loan and meet other basic expenses. These examples demonstrate why the majority of borrowers are repeat borrowers, taking out loan after loan as fees force them to fall further and further behind. However, these products may become harmful for consumers when they are used to make up for chronic cash flow shortages. We find that a sizable share of payday loan and deposit advance users conduct transactions on a long-term basis, suggesting that they are unable to fully repay the loan and pay other expenses without taking out a new loan shortly thereafter. Two-thirds of payday borrowers in our sample had 7 or more loans in a year. Most of the transactions conducted by consumers with 7 or more loans were taken within 14 days of a previous loan being paid back — frequently, the same day as a previous loan was repaid. Supporters of SB 975 will argue that it establishes a limit of eight “consecutive short-term” loans, which is an acknowledgment that rapid, repeat borrowing is at the core of the payday loan product. But this limitation is effectively meaningless because the bill allows a borrower to simply wait three business days to borrow again, so the eight-loan limit would never really apply. As the CFPB data make clear in states with laws like SB 975, the typical borrower of what is supposed to be a 14-day loan is indebted for more than half the year. In other words, the typical consumer borrows $350 and ends up paying $457 in just interest and fees in places where these types of products are legal. High interest and fees plus repeat borrowing are the keys to payday lender profitability and why this product is ultimately harmful to consumers driving some into bankruptcy. You borrow over and over, and what do you get? Another day older and deeper in debt.